These pictures are courtesy of Howard Bigelow, immediate past President of Viet Nam Veterans of America Chapter 890 here in Sandpoint. Charlie with axels inserted, sitting on the ground, fork lift about to disengage. MANY, MANY thanks to all the wonderful people who showed up and helped unload and secure Charlie. Your help is greatly appreciated. Now we have to get together and create some work parties to get the beastie put together and spruced up. Saturday morning, 10:00 AM at Quality Collision, 315 So. Ella St at Hwy 2, for those who want to play! is a guy who's dressed in sunglasses, a loud Hawaiian shirt, leather jacket, jeans and sandals. whether or not to admit you to the Kingdom of Heaven?" helicopter Pilot from Siloam Springs, Arkansas." pilot goes into Heaven with his robe and staff. "I am Father Bob, pastor of Saint Mary's parish for the last 43 years." cotton robe and wooden staff and enter the Kingdom." robe and golden staff and I get only cotton and wood. How can this be?" "Up here - we go by results," says Saint Peter. "When you preached - people slept. When he flew, people prayed." Here is a night carrier landing of a Navy jet plane. This is in calm weather, no rain. Try to imagine landing at night in very bad weather! This is what Carson did in F-14's during his Navy career. What a guy! Then he went on to airline flying and retired from that. He delivers helicopters for fun. I could not find the series of three: night, bad weather, pitching deck. If someone finds it, please let me know. Thanks. There is a great series of videos on youtube about Night bad-weather carrier landings on youtube. just type in night carrier landings. You will find your adrenaline flowing, and feel yourself squirming in your seat trying to get these guys aboard! Here sits Charlie in her new home, on her axels, safe and secure behind high cyclone fencing. Charlie rests after a hard journey in the lot at Quality Collision Repair. Isn't she beautiful? Just a little sprucing up and paint, and she will look like new, I'm sure! We especially need someone who knows about the wheels, tires and bearings for the running gear so we can roll her thru town on May 20.The "Lost in 50's" event is rapidly arriving. We rented a humoungous construction fork-lift to lift Charlie off the trailer. Above is a picture of the forks being threaded thru the lift cables above the rotor head. The second picture is with tension on the cables and Charlie about to become "airborne." Possible for the last time, ever. This Last picture of Charlie actually off the ground and floating in mid-air. I practiced with the fork lift for about two minutes and thought I was an ace. it was very embarassing that every time I tried to move the helo an inch or two, it would jump about six inches, and usually in the wrong direction! By the time we were done, I had developed the finesse it took to move it very slowly, and inch at a time, but I still had trouble with direction of move! But, we did it! We got Charlie off the trailer and got the landing struts and axels attached, many thanks to Carson for hanging around long after he had to, and providing his experience and expertise with these manuevers.see next set of pictures. 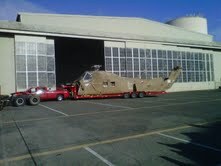 April 20th, the H-34 finally got delivered to us. Here is a picture of "Charlie" at the Conoco gas station as you enter town. At this point I abandoned my car and jumped in with Carson to guide him through town. Previous to this I went through town and measured every wire to make sure we would not catch one on Charlie's rotor head, which was almost fourteen feet above the ground. We made it through OK. Here is Charlie at the side street, just before turning onto Ella Street, its final destination. Here it is, after being backed into the side yard at Quality Collision repair. The tail is folded for easier handling. Everett Wood, Commandant of our local Marine Corps League Detachment on the right. in red, and Howard Bigelow on the left, immediate Past President our our Local Viet Nam Veterans of America Chapter. more pictures and commentary right away. We just got a text msg from Carson, the former Navy F-14 pilot, who is driving the truck delivering Charlie. He departed Everett at 0600, ETA Sandpoint 1400. Any body who lives nearby and wants to come welcome Charlie....COME ON DOWN! 315 So. Ella St, just behind TRADERS lumber yard. at Quality auto repair. Pictures of Charlie's arrival will be posted soon. We just got an email from Tim Adamson, the helicopter seller, in Everett--Charlie is loaded on a trailer and is ready to roll; we expect delivery at 2:00 PM tomorrow, after a day's delay. YEA! Finally, this is coming together. Delivery of "Charlie" has been delayed. The people doing the delivery could not get ready for today. Shooting for tomorrow. Updates will be posted. "Charlie" to be delivered soon; in a parade, too! Here is a picture of an H-34 flying in Viet Nam taken in the Summer of 1966. It's from HMM-161, flying south near the coast of Viet Nam, from Dong Ha to Phu Bai. The pilot is First Lieutenant John "Nasty" App. For those who live near Sandpoint, we are going to have a meeting Saturday the 16th, 10:00 AM at the lot where Charlie will live. The location is 315 So. Ella Street, Sandpoint. (This is right beside/behind TRADERS lumber yard, across Hwy 2 from Dairy Depot.) It is more for discussion of what, why, how, when etc. of what we are going to do with Charlie after she gets here, but it will also be to see if we can get together some specific work committees to attack whatever things that need to be done to/for Charlie. One thing we need to do right away is repair about thirty feet of cyclone fence at the rear of the lot where Charlie will be placed. The posts are still in place, the fencing material is available, but we need someone with cyclone fence repair abilities to repair the fence. We have the fence stretching tools. We are hoping we can get the wheels under her, and get a few parts attached so she will be halfway presentable. Our tenative plan is to pull her throught town every "Lost in 50"s" and every Fourth of July parade, and pull her over to our veterans STANDOWN at the fairgrounds every June, too. GOOD NEWS! about the place where the helicopter will sit. Richard Oliver at Quality Collision Repair had originally given us only tenative permission to park Charlie on his lot for a short while. He was thinking his landlord would not be agreeable. After checking, Richard got a green light from his landlord, so it appears that Charlie has a semi-permanent home at Quality. Both Richard Oliver and his landlord are both veterans, too. Richard served in the U.S. Navy. Richard's wife, Jonnie Bradley, publishes the WIZE GUIDE, and is creating a full page article about Charlie in her next edition, soon to be published, which will have 10,000 copies distributed in our area. YEA, Jonnie! More later as things develop.